Happy Monday, everyone! If you celebrate, I hope you had a good Easter! I had a lot of family time, church time, plenty of personal space being invaded by nephews (if anyone is going to invade my personal space, it’d better be them), and enough sugar to jolt a sloth. While I know a lot of people go the church -> brunch -> mimosa -> nap route on Easter. I’ve always admired that plan, but in my family we have a big dinner and generally skip the big mid-day meal. Or at least downsize it considerably. This year, church was a bit earlier than usual (9 am…ouch) so naturally I was already asking about where I could access food immediately after the service. I’m an infant and I need to be fed at regular intervals. Luckily, my family is pretty well aware of that. My parents and I decided that I would make something for brunch as soon as we got home from church, so once I walked in the door I dug around their fridge for a while to see what kind of ingredients I was working with. Bag of shredded hash browns? Yes, please. Obviously, eggs are an appropriate decision for Easter. Done. A quick check of the snack drawer and bacon was confirmed. 2. Spray a 9×13 baking dish (or pie plate) with cooking spray. 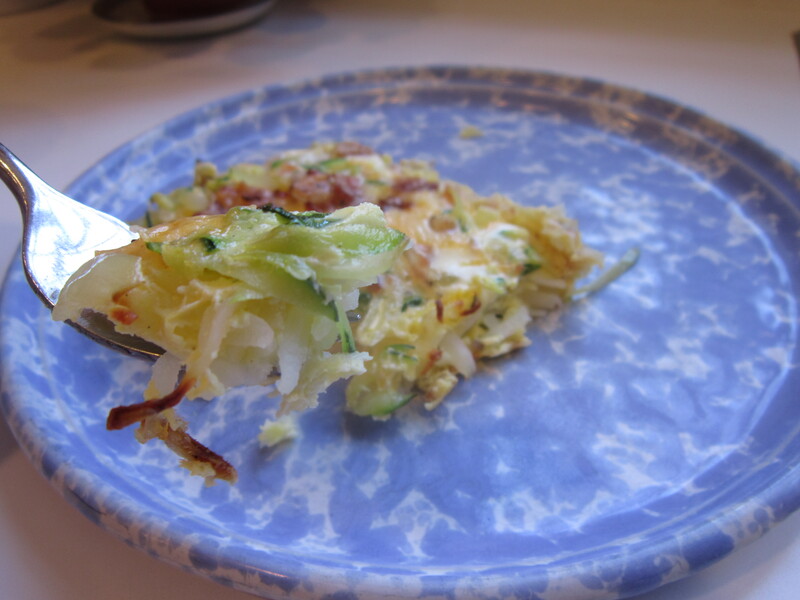 Spread hash browns in an even layer in the dish and press down lightly to slightly pack them in. Spray with cooking spray again and season with salt and pepper. 3. Bake hash browns for about 30 minutes, until beginning to brown. Remove from oven and turn heat down to 350°. 4. 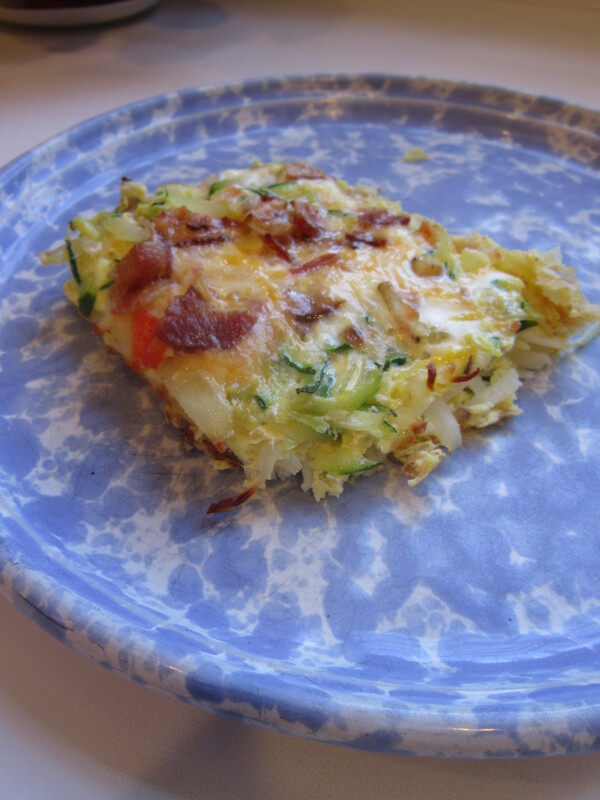 While hash browns bake, place bacon in a skillet over medium-low heat and cook until crisped to your liking. Remove from skillet and crumble. 5. Shred zucchini with a box grater or in a food processor with the grating attachment. Place in a clean dish towel or paper towel and gently squeeze to remove most of the moisture. 6. In the same skillet that you cooked the bacon, saute the onion, bell pepper and zucchini over medium heat until soft, about 5-7 minutes. 7. Crack eggs into a mixing bowl and beat lightly. Add milk, cream, cheese, reserved bacon, a pinch of salt, pepper and garlic powder and whisk to combine. 8. Spread the vegetable mixture in an even layer over the potatoes and then pour egg mixture over, tilting the dish slightly to make sure the egg reaches all corners. 9. Bake for 20-25 minutes until the top is slightly puffy and the mixture does not wobble at the sides when the dish is tapped. Allow to rest for a few minutes before slicing into 6 pieces and serving. I have to say, even though there’s bacon and cheese in this casserole, it’s really not very heavy. It is very flavorful, though, and everyone seemed to enjoy it (considering 3 of us slammed almost the entire thing). Of course, it put me in the mood for a mimosa. But there was no champagne. But then we found a bottle of prosecco in the back of the fridge! But then there was no orange juice. Good thing it was only a few hours until our next meal. And by then, of course, I was already sniffing around the kitchen before everything was ready. Uh, yeah. That’s a straight-up BONE. 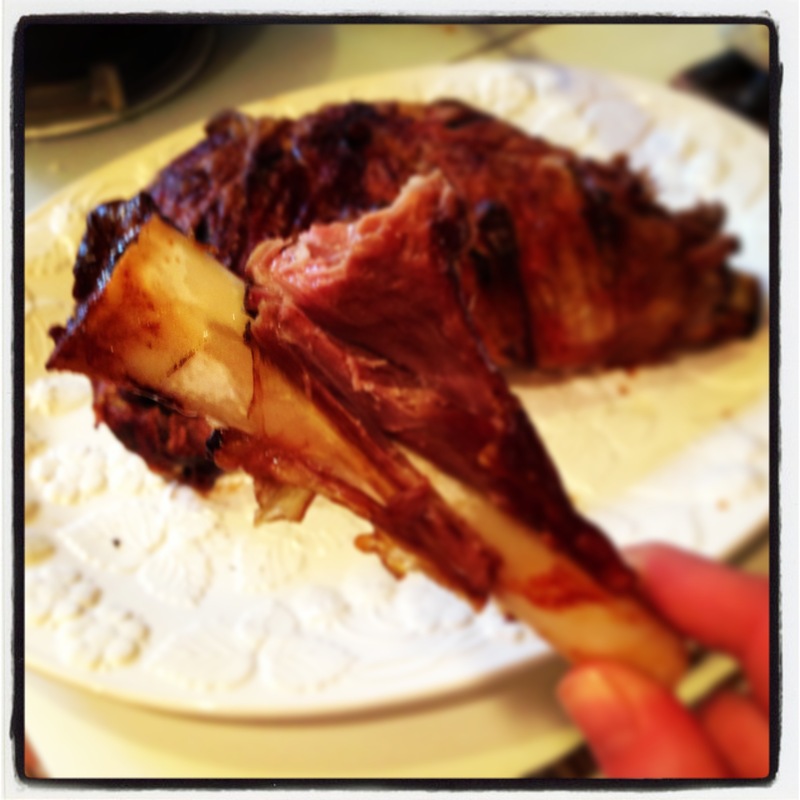 A bone from the lamb roast for me to gnaw on. So basically my eating habits either make me an infant or the family dog. Either or. At least there are leftovers! What a great Easter brunch meal! It was! Hope you had a nice Easter, too! Looks great! We did the lunch + wine thing and then I was a sloth the rest of the day. Yeah, that is the downside, I suppose. I love a good mimosa buzz -> nap, though. This looks awesome!! I love easy throw-together brunchy foods. And mimosas. Duh. Duh. I STILL want a mimosa! Mmmm . . . I love anything with hashbrowns in it. This sounds so amazing. Me too. Shredded hash browns are miraculous. Haha enough sugar to jolt a sloth! That’s funny. I can’t do lamb. makes me sad:( But I hear it’s tasty. Casseroles are always a good go to, great looking recipe.